Scrubber Square -- $1.99 A Crochet pattern from Julie A Bolduc. 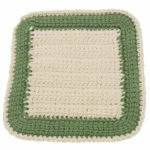 This scrubber square can also be used as a 4" square in an afghan! It is fast and easy to make and a bunch of them stuffed into a wicker basket would make a great gift or bazaar item.